Home/Featured & Recommended/“THE HOLE IN THE GROUND” movie, one night only! “THE HOLE IN THE GROUND” movie, one night only! Trying to escape a broken past, Sarah O’Neill (Seána Kerslake) is rebuilding her life on the fringes of a backward rural town with her young son Chris (James Quinn Markey). Following the discovery of a mysterious sinkhole in the vast forest bordering their new home, Sarah must battle to unearth if the disturbing changes that begin to manifest in her little boy are a transformation driven by something more sinister and threatening than her own maternal fears. 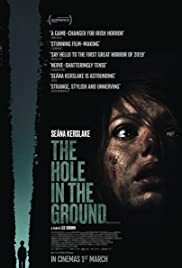 Written and directed by first-time feature filmmaker Lee Cronin, “THE HOLE IN THE GROUND” is a well-crafted and suspense-fuelled horror that distorts the familiar to create a disturbing excursion into fear and paranoia.